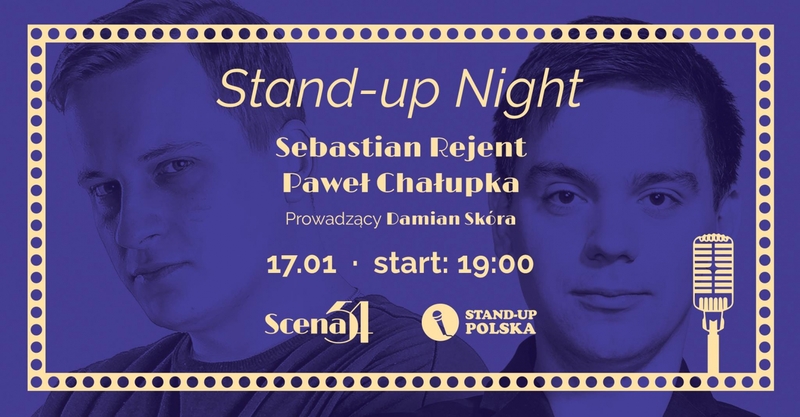 On Wednesday, 17.01 during the second edition of the 'Cyclic Stage Performance' - a series with leading Polish stand-upes, in Scenie54 at 10/30 Dolnych Młynów next comedian from Stand-up Poland will perform - Sebastian Rejent and Paweł Chałupka, and the event will be hosted by Damian Skin. Sebastian Rejent - a champion of roasting, who probably took part in all roasts in Poland. He does not like the stasis #naScenie, he rather prefers to do something on it. He has, among others, Three adult people who have lain with laughter during his performances. During his stand-up career he started cooperation, among others from Comedy Central. Paweł Chałupka - on the stand-up scene since 2011. Winner of the 2nd place on the stand-up concert festival 2015. Was seen in the program of Kuba Wojewódzki, on TVP Entertainment in the program 'Only for adults', Comedy Central and also on the crop of Tego Type Mesa and Popka. Damian Skóra stand-up - a member of Comedy Lab groups and the English-language Krakow Stand-Up Comedy. The winner of the plebiscite for the best stand-upper according to his mother. In last year's competition for the best Damian Skóra he took the second place. Awarded many times for outstanding achievements in Latin and mute singing. The author of such hits as 'Eh nice, you would smile as much as on instagramie' and 'without meat - without sense'. Tickets on the day of the event at PLN 40 will be available at the entrance only if the whole pool has not been sold before.